In December WordPress 4.7 was released. The most cool part of this release was the inclusion of the WordPress REST API. In development for quite some time it was finally included in core. Did we say all pages? Yup, that’s right. All Most of your posts, pages and users are exposed to the public with this API. That includes pages that have no public links to them and pages that are not available in any menus on your website. So some of the WP devs here at Earth People got curious about the API and what exposed stuff we could find on those websites on the internet that had updated to 4.7. We figured that an easy way to test this was to create a Google Chrome extension. 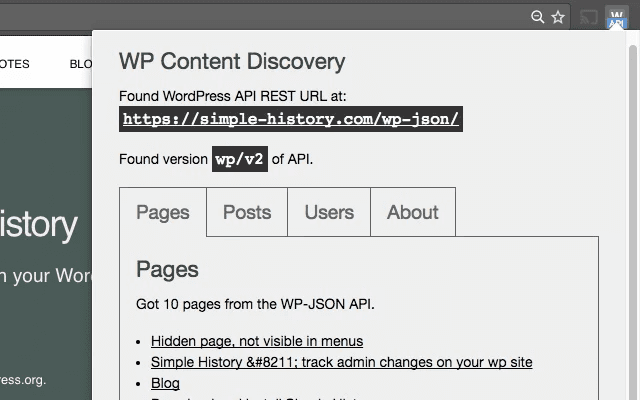 So we made the the extension and we called it WP Content Discovery. 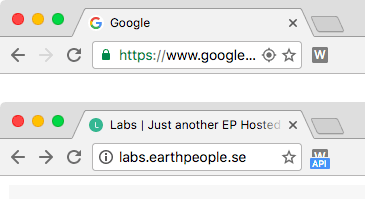 It adds an icon to your chrome toolbar. By default it only displays the letter “w” as in WordPress. When you visit a WordPress powered website and it detects the API is lightens up and displays “API” in blue. The extension icon in action. On the first site no API is detected. On the second site the API is detected and the icon shows a blue API text. Now the fun starts: click the icon to get get a list of pages, posts and users on that website! Please try the extension. And please let us know what you think here in the comments! Even if all the data that you can get publicly from the REST API is already available somewhere in WordPress, it does freak some people out that it actually is possible to get the content so easily. It is however pretty easy to disable the API if you find it to scary.